At 1339 on April 6, 1945, Flight Chief Petty Officer Shinzō Tabata took off from Kanoya Air Base as pilot in a Zero fighter carrying a 250-kg bomb and died in a special (suicide) attack off Okinawa at the age of 20. He was a member of the Kamikaze Special Attack Corps 1st Shinken Squadron from Ōmura Naval Air Group. He was from Kanagawa Prefecture and was a member of the 14th Otsu Class of the Navy's Yokaren (Preparatory Flight Training Program). Finally I will do it. Flight Petty Officer 2nd Class Hirade from Kawasaki  is my wingman. Our spirits are one as persons from the same prefecture. Ah, it is truly joyful to make a sortie to the front line. I pray for the health of you and everyone. The letter comes from Mainichi Shinbunsha (1968, 122-3). The biographical information in the first paragraph comes from Mainichi Shinbunsha (1968, 122) and Osuo (2005, 201). 1. Kawasaki is a city in Tabata's home prefecture of Kanagawa. 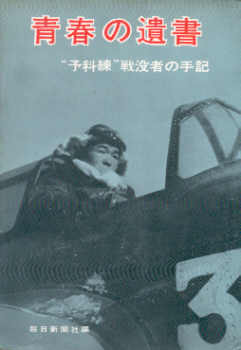 Osuo (2005, 201) indicates that Kōji Hirade also died in a special attack on April 6, 1945, but his sortie time was 1610, about two and a half hours after Tabata's.